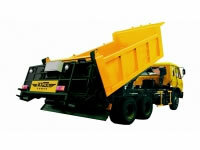 Gaoyuan offers pavement contractors a series of aggregate screening plants designed to filter and spread the aggregate. A module design is used for convenient transfer and assembly. Aggregate Screening MachineAs the auxiliary equipment for micro-surfacing construction, aggregate screening machines are capable of working simultaneously with micro-surface pavers. 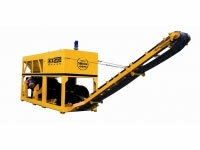 The aggregate screening machine removes large stones in aggregate, thus ensuring the construction quality.With its small size, the aggregate screening machine covers a small area, making it easy to move to different areas for different work sites. Aggregate SpreaderAggregate spreaders are specialized equipment for spreading aggregate, and we are able to customize these spreaders to meet specific customer needs.The operator can individually control the 16 discharge gates. As a result, the spread width is easily adjustable.The discharge gate is equipped with a micro-adjusting mechanism to adjust a single discharge gate, thus ensuring a uniform aggregate spread. 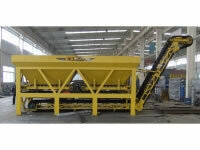 Aggregate Screening and Mixing MachineThe aggregate screening and mixing machine filters the aggregate using a double layer linear vibrating screen. A binder is then added for premixing. In doing so, the aggregate surface will attach itself to a layer of the binder to ensure the bonding between the aggregate and asphalt is more solid in a slurry seal.